If so then many wearing this t-shirt will make you hungry in time for breakfast. 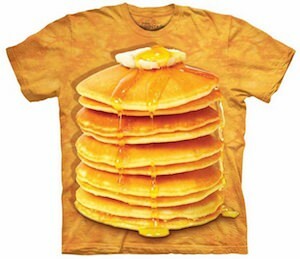 On this t-shirt you can find a nice stack of pancakes with on top some butter and syrup is dripping of it. Hmmm yummy now I do want some pancakes. As you can see the pancake stack on the t-shirt is pretty big and covers the whole front of the shirt and that means that they should be some giant pancakes. You can get this amazing pancake t-shirt in sizes Small – 5XL and if you are a size small now then after all those pancakes you may end up being a 5XL. Bring breakfast to the masses by wearing this fun PancakeT-Shirt.